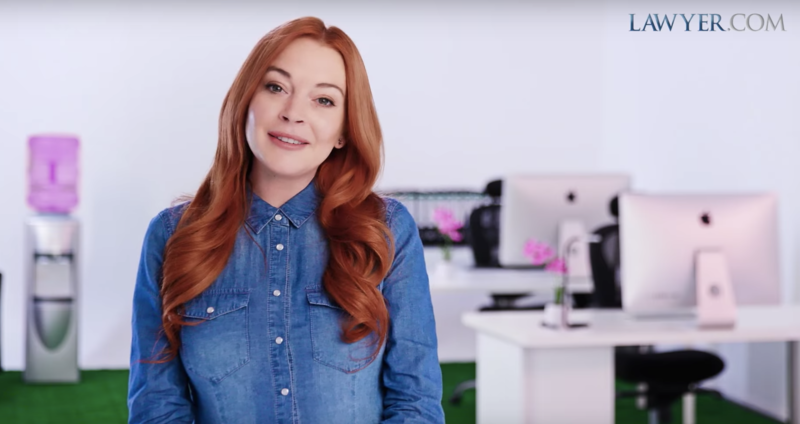 In her debut video for the lawyer directory company, Lohan, who famously spent much of the latter half of the 2000s embroiled in numerous legal battles, poked fun at her own legal history. “When Lawyer.com first reached out to me, I was confused and a little scared because I thought I was in trouble. But when they asked me to be their spokesperson, I was intrigued,” Lohan joked. "Lawyer.com is about protecting people. From getting a DUI — let's not pretend like I didn't get one...or two or three or some others..."
Between 2007 and 2013, Lohan made headlines on many occasions following arrests for driving under the influence, shoplifting, assault, and leaving the scene of an accident, with subsequent arrests for violating probation and failing to complete court-ordered counseling sessions and community service. She was finally released from her probation in 2015. In addition to being the spokesperson, Lohan will also serve as a marketing and brand advisor for the company. While her new partnership with Lawyer.com is certainly perplexing given her history, it is refreshing to see the actress look (and sound) so much like her former self. Fingers crossed we’ll be seeing her in Life-Size 2 soon.